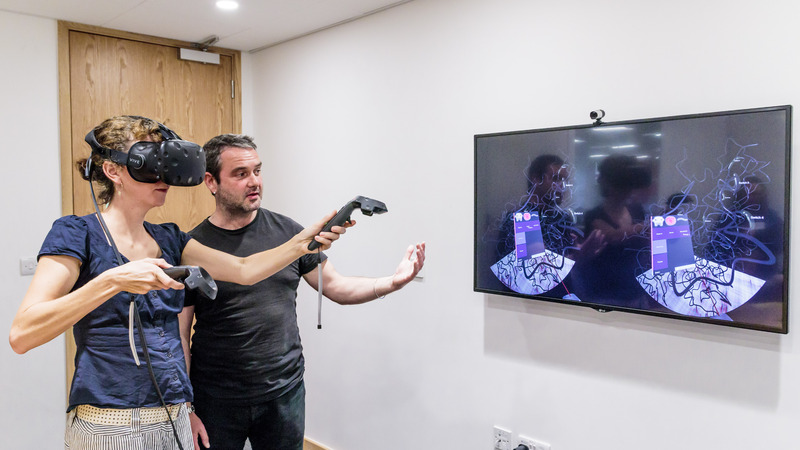 Researchers from Oxford have been using virtual reality software to compile genetic data to create models which explain how genes are controlled within their natural chromosomal environments. The team from the MRC Weatherall Institute of Molecular Medicine (WIMM) have been working in collaboration with physicists from Universita' di Napoli and software developers and artists at Goldsmiths, University of London, to visualise complex interactions between genes and their regulatory elements in an interactive format. The simulations are a composite of data from genome sequencing, data on the interactions of DNA, and microscopy data. When combined, this provides an interactive, three dimensional image that shows where different regions of the genome sit relative to others, and how they interact with each other. ‘Being able to visualise such data is important because the human brain is very good at pattern recognition – we tend to think visually,’ said Stephen Taylor, Head of the Computational Biology Research Group at the MRC WIMM. There are around 37 trillion cells in the average adult human body, and each cell contains two meters of DNA tightly packed into its nucleus. While the technology to sequence genomes is well established, it has been shown that the manner in which DNA is folded within each cell affects how genes are expressed. Understanding the interactions between genes and their regulatory elements is becoming increasingly important in understanding the basis of human genetic diseases. Prof Jim Hughes, Associate Professor of Genome Biology at Oxford University, said: ‘There are more than three billion base pairs in the human genome, and a change in just one of these can cause a problem. As a model we’ve been looking at the human alpha globin gene cluster to understand how variants in genes and their regulatory elements may cause human genetic disease. The team are applying these techniques to study genetic diseases such as diabetes, cancer and multiple sclerosis. Professor Doug Higgs, a principal researcher at the WIMM, added: ‘We’ve come a long way in the decades that I’ve been researching in this field, and we’re using increasingly sophisticated techniques to examine our DNA, how it is packaged and how this relates to the regulation of gene expression. ‘Our ultimate aim in this area is to correct the faulty gene or its regulatory elements and be able to re-introduce the corrected cells into a patient’s bone marrow: to perfect this we have to fully understand how genes and their regulatory elements interact with one another.